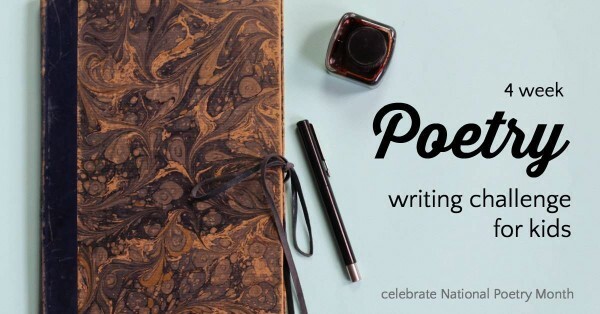 My favorite time of year is April, not because of the spring blossoms (although that is a nice bonus) but because it is National Poetry Month! Now, no one should restrict their exposure to poetry to just one month a year. (oh, the horror!) Unfortunately many people balk at the idea that they, too, can learn to write poetry. Nevertheless, it is a great time to get those poetic juices flowing. For the past two years, I’ve been sharing poetry challenges during National Poetry Month. The first was a 5 week poetry reading challenge and last year I did a weekly poetry writing challenge, which I am conveniently putting all in one place for you here (isn’t that considerate of me?). 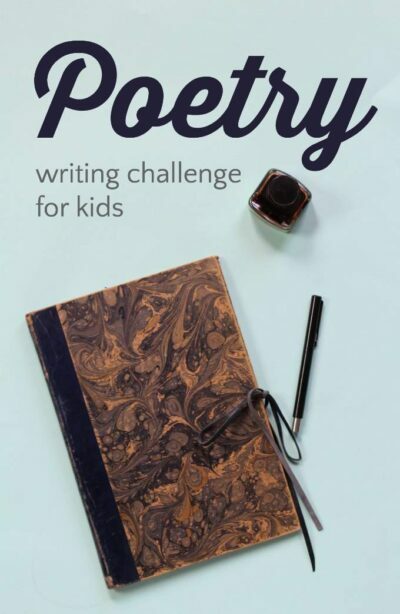 The purpose of this poetry writing challenge is to expose kids to different kinds of poetic forms and to make the prospect of writing poetry totally un-scary. At the end of 4 weeks, they will be amazed at how easy it was to learn to write poetry. Each challenge has two parts. The first is to learn about a type of poetic speech, and the second part is to compose a simple poem. I’ve organized the challenge so parents (and teachers and librarians!) can be relaxed about following the guidelines. It’s called a poetry writing challenge, but kids don’t actually have to pick up a pencil if they don’t want to! Each weekly challenge includes extension activity suggestions for the ambitious among you, as well as books to read. No more stalling! On to the challenge! Exercise 1: Learn about similes and create your own. Extras: Find books and make art! Exercise 1: Learn about alliteration and practice creating your own. Exercise 2: Write a 5 senses color poem. Extras: Find books, make art and learn about other types of color poetry. Exercise 1: Learn about onomatopoeia. Exercise 2: Write a rhyming couplet. Extras: Learn about other types of rhyming poetry, find books, and get physical! Exercise 1: Learn about hyberbole and laugh yourself silly. Exercise 2: Write a haiku. Extras: Make art, have a contest, create books, and more.